Greencode is a theme I developed for WordPress blogs that is based on a previous design of my website. Greencode implements “tagging” instead of “categories” and features a tag cloud instead of a category list. Each page has a sidebar, including single post pages. The theme includes a print stylesheet for cleaner printed pages. The code for the templates is valid XHTML. Greencode has a custom view for visitors using the Nintendo Wii’s Web browser. 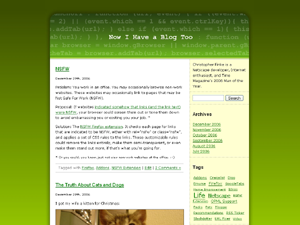 Although it may look as if the blog title is part of the header image, the title is actually positioned over a blank spot in the header. If your blog title is significantly longer than 20 characters, you may want to edit the header image to leave more blank space. You can e-mail me for the high-quality, layered Photoshop file. It is compatible with WordPress 2.0-2.1.2 for sure; your mileage may vary with other versions. The latest version of Greencode is version 0.4, released on 2007-03-03. Full theme installation instructions can be found at the official WordPress site, but in short, unzip the files and upload the greencode/ directory to wp-content/themes/. Then choose the “Greencode” theme in the Presentation tab of your blog admin panel. Feel free to contact me with any suggestions or feedback on this theme. Note: watch the Greencode section of my blog for information on updates to this theme. Is the theme compatible with wordpress 2.1 as well? Does this theme have a wide version too? A very cool theme. I will download it for my next website which is coming soon. I do happen to agree with Kulin about a bit more space for content.